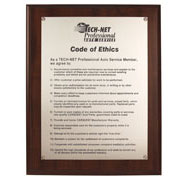 The TECH-NET Professional Mission Statement TECH-NET Professional is committed to serving you, our customer, with professional automotive repair at a reasonable cost with qualified technicians. We use quality CARQUEST Auto Parts, guaranteed coast to coast. We stand on sound business principles and uphold high ethical standards. Our goal is to make your automotive repair experience friendly and successful.